This mosaic style design is customized with sand from your favorite beach and vibrant lapis or amazonite. 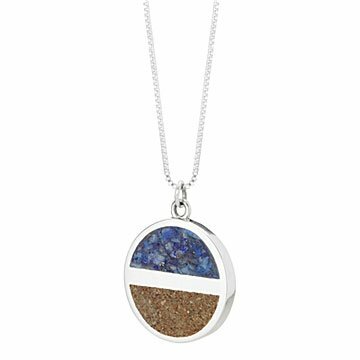 Keep sand, surf, and sky close to your heart with this charming coastal pendant by Holly Daniels Christensen. Each design is custom made with sand from your favorite beach and vibrant lapis or amazonite, echoing the infinite blue seen from the shoreline. Like a miniature mosaic, the "sky" and "beach" are split by a shimmering sterling silver divide to represent the horizon. It's an elegant gift for coast-craving friends or loved ones who cherish the salty air. Handmade in Massachusetts. Polish silver with the packaged polishing cloth, then buff sand and resin with wax and rinse with warm, mild, soap and water. I haven't given her this gift yet. I hope she loves it. The necklace is very unique. My friend loved it. She can't wait to wear it. I was able to collect sand from the beach outside our condo in Naples, FL. I consider the beach there my "happy place", so I was thrilled to find this necklace that would mean I could carry it with me always. It is absolutely stunning! It looks just like the picture. If you are a beach-lover like me, this is totally worth is to be able to carry the beach with you every day!